Creightons stores are located in South Belfast – Balmoral, Finaghy and Blacks Road. 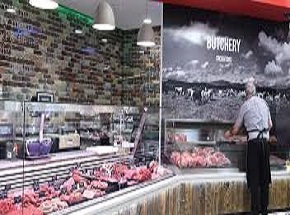 The Balmoral store opened recently and is a 6,000 sq ft Eurospar, Butchery and Deli specialising in local products. Creightons endeavour to sell as many local products as they can source including Givan’s Ham, Cavanagh Free Range Eggs and Kennedy Dry Cured Bacon All the meat for the butchery is sourced locally from the family farm in the Clogher Valley. A state of the art kitchen means all the food in the deli counter is produced fresh every day. The kitchen also produces an excellent range of ready meals and pre-packed salads which are sold in all the stores. Deli cooked breakfasts include soda farls and potato bread baked daily by Country Kitchen just up the road in Lisburn. Creightons now produce their own Gelato ice cream, with a huge range of flavours – unbeatable on a hot summer’s day!